Inline topic actions can become longer when translated, and the list wraps to a second line and overlaps with some of the content, see the screenshot. One option is to remove "Stick (to all forums)" action from that list, as it's used much less frequently than others. It would also improve #1996 further. 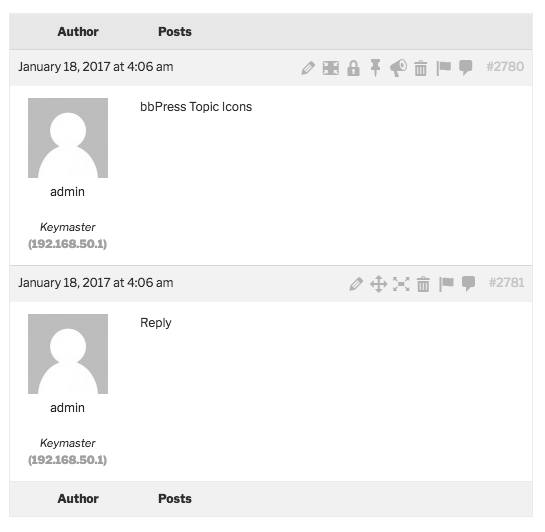 The action would still be available via the "Topic Admin" menu in the sidebar, it just doesn't have to be an inline action. meta-2398.PNG​ (11.8 KB) - added by SergeyBiryukov 2 years ago. meta-2398.2.PNG​ (16.7 KB) - added by SergeyBiryukov 2 years ago. meta-2398.patch​ (1.8 KB) - added by SergeyBiryukov 2 years ago. meta-2398.3.PNG​ (31.8 KB) - added by SergeyBiryukov 2 years ago. Generally speaking, I like icons for actions. But I think in these instances, there are too many which make them too ambiguous. meta-2398.PNG​ may not look pretty, but doesn't display any issues otherwise. meta-2398.2.PNG​ illustrates an actual issue where a link is hidden behind the actions, and it's easy to accidentally click one of them instead of the link. I like the direction of swapping the links with dashicons, but yeah, some of them seem ambiguous at the first glance, specifically Merge, Move, or Split. 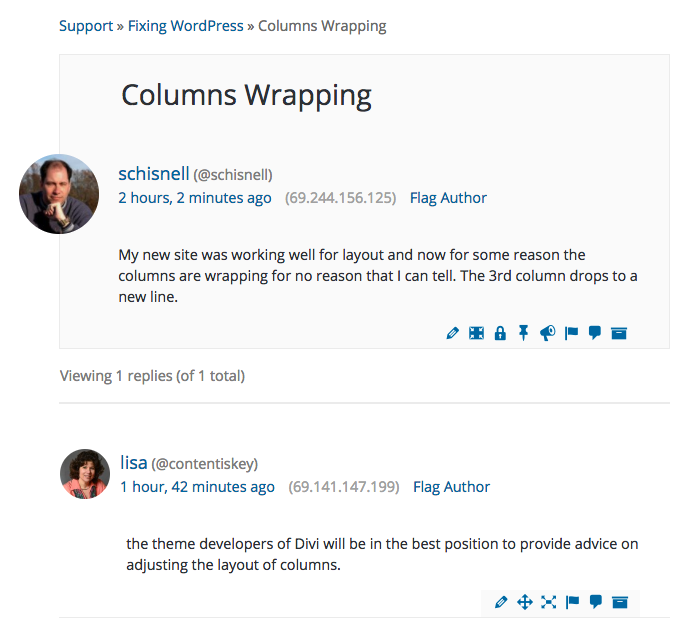 On a related note, I don't see a purpose for "Reply" action there either, as WordPress.org forums don't use threads, and that link just redirects to the same reply form without any visual difference. #1977 introduced a "Reply to Topic" link in the sidebar for that. I was referring to the one that shows on hover in the first post of a topic. I think we need a new UX solution here (cc @mapk). Icons aren't great – for reasons mentioned above – but text isn't great in its current form either. It'd be good to get a full list of all moderator/admin links that are required, which are not necessarily the ones that are there now (as mentioned above). With that, we can start to think through a new UX that will scale better for translations and hopefully work better for moderators / plugin authors / everyone(!). Moved to a separate ticket: #2519. Going to go with meta-2398.patch​, which keeps the essential actions (Edit, Close, Spam, Unapprove, Archive) as inline quick links: meta-2398.3.PNG​, and moves the rest (Merge, Stick) to the Topic Admin sidebar section. 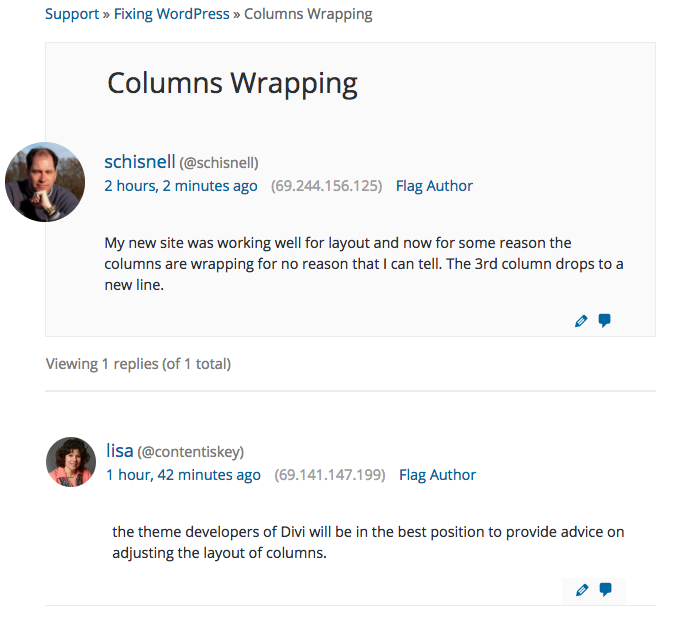 Reply link is removed completely, as it's redundant since #1977 introduced a sidebar link for the same purpose. Seems to be the most logical solution here: it reduces visual clutter, works better for translations, and doesn't require a new UX solution for now. Unapprove probably shouldn't be there either, as "bad" topics are generally either archived or marked as spam, not pushed back to Pending queue. But let's keep it for this iteration and remove later if needed. This helps to avoid visual clutter and provide enough room for translations. 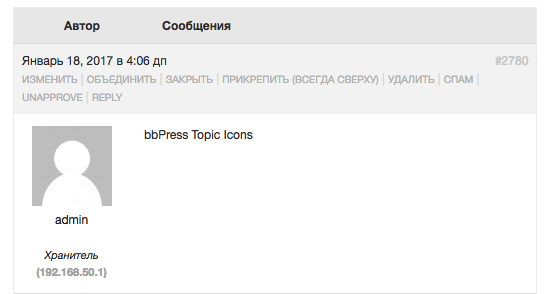 Less commonly used actions (Merge, Stick) are still available via "Topic Admin" sidebar section. Reply link is removed completely, as it's redundant since  introduced a sidebar link for the same purpose. The most recent conversation and links to previous conversations in #bbPress on Slack are ​here.